The visual word clouds created by Wordle and other word cloud services on the web aren’t anything new, they’ve been around for a few years. However, like a great many newer web 2.0 tools, I quite often see a lot of ineffective use of these tools in the classroom. That’s not to say I think the teachers themselves are ineffective, in fact it’s usually the most tech savvy and educational effective teachers that are using tools like Wordle. However, as even these tech savvy teachers keep up with the changing landscape of educational tools, not enough time is often available to closely examine a new website to carefully dissect what the tool is capable of, and how it might be used most effectively. Too often a larger number of teachers get caught up in the “wow” factor of some great new ability of the read/write web (does anyone still use that term anymore? ), and immediately starts working the new-found website into a class project. Again, I’m not trying to call out poor practice, but rather the lack of time and priority that teachers have when it comes to wrestling with all of these ever-changing and growing arsenal of web tools that have excellent use for the classroom. Before I get started on a rant about how little time teachers have to work on their craft outside of instructional time, I’ll get back to Wordle. 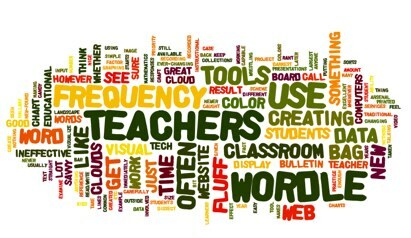 The most common use I see for a website like Wordle, that allows you to input any text and create a frequency word cloud (see image at beginning of article) is to “creatively” display student’s work out in the hallway on a bulletin board. This is what I like to call “fluff”. Sure, it’s good stuff, it makes the kids feel good about creating something so pretty, and every teacher has to produce some amount of fluff each year. Whether it’s to display during conferences, or just to showcase some student work, teachers use fluff in all sorts of forms; bulletin board, video, presentations, etc. The problem is, Wordle often never gets past the fluff stage in the classroom, so here are three ideas that I’ve seen teachers use to get a bit more use out of Wordle. Making data visual is nothing new, and it’s something that any teacher of mathematics does whenever talking about graphing, probability, and frequency. Sure, there’s a lot of straight lines and chart paper involved, but doing something as simple as creating a bar chart to visualize data helps learners tremendously. And you could do the same thing with Wordle and frequency. Take the example of pulling M&Ms out of a bag and recording the frequency of each of the pieces of candy in the bag. By putting the recorded data into Wordle, you’re given nice visual cues as to the frequency of colors in the bag. 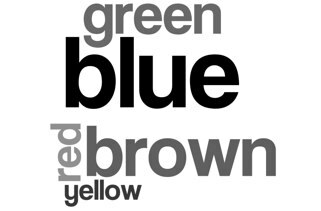 In this case, blue was the color pulled most often from the bag denoted by both it’s size (the largest of all the words), and it’s color (the darkest of the words). You could play with the color scheme for different effect, but the result would be similar. Whether you have computers for all of your students, or just a few classroom computers, it would be very easy to have a few students responsible for creating word clouds in addition to the traditional frequency charts or other data collections methods (think about polling students and creating clouds from their responses). It would be quick, and the result could be printed out, or just have a screenshot taken as a reference for later. In many schools I’ve been in I’ve heard about using “juicy adjectives” to spruce up a piece of writing. Rather than rely on a view adjectives over and over again like “good” or “bad” while writing a narrative piece, the idea is to have a battery of “juicy” words that could be substituted (synonyms that is) so the writing isn’t quite so monotonous. I like the idea of using Wordle to weed out over-used adjectives (or verbs, or any other part of speech for that matter), because it’s fun, it’s quick, and it’s easy. I went ahead and quickly copied everything in my post thus far and pasted it into Wordle. In a little less than 30 seconds I had an easy to read road map of which words I’ve used most heavily in this post thus far, and have an idea of which I should stay away from. If I were a student I wouldn’t have to go to the teacher, or have any peer editing done yet. With a few clicks on the mouse, and a copy paste I can know see that I’ve used “creating” and “classroom” quite a bit, with “teachers” and “wordle” fighting for top usage. There’s not much I can do about getting around using the term Wordle, but I could always adjust my writing, or go back and do some editing to introduce words like “learning environment”, “construct”, or “educator” in order to “juice up” my writing. No printing, and not much time needed for a quick writing tweak. You could compare the progress of a student’s writing by saving the wordle of each draft, or periodically throughout the writing process. With the State of the Union Address still fresh in the minds of a few political pundits here in America, I thought I’d do a little experiment and see what would happen if I were to compare the top 50 words from two different state of the union speeches given by two different presidents (Wordle allows you to limit the word cloud to a certain number of top frequency words). You could apply the same example to famous speeches performed throughout history, but in this case I think it would be interesting from a political and societal standpoint to compare in what direction the country is headed, or rather what is consuming our collective thoughts, by taking a look at one of the few speeches that is held an an annual basis that is meant to reflect upon the sentiment of the nation and our current direction as a country. Notice the difference in the state of the union address given just this year, versus the one given 80 years ago in 1930 by Herbert Hoover. 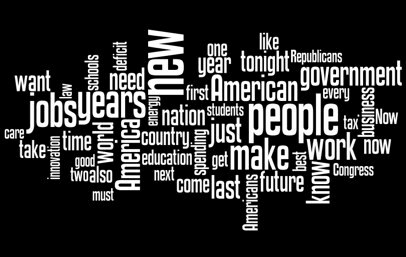 More common place words like “American” or “people” don’t even appear prominently in the 1930 speech (the bottom word cloud). 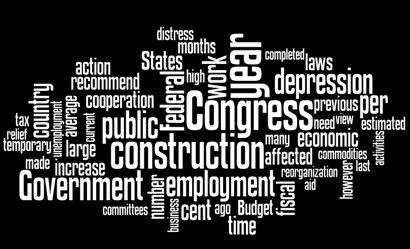 However, words related to jobs, work, spending, business, and the economy pop up frequently in both. Sure, any decent history teacher could simply point this out to students, or include this in a lecture, but that’s not exactly a 21st century educational mindset. Allowing students to quickly, and easily, create a visual comparison of two important speeches in a country’s past can help create not just a lasting impression of the message being conveyed, but a great way to skim future texts when comparing. Getting a grasp of the nation’s mood based on the oratory of the day would be an interesting exploration in a history or civics class. Have an idea of how Wordle could be used for more then “fluff” in your classroom? Please share via the comments below! This post has been particularly popular in the few months since posting, so I wanted to include a link or two to some iOS apps for creating Word Clouds on your iPod, iPhone, or iPad. They’re both nice native platform solutions for quickly creating word clouds, that are specifically NOT for fluff. While not providing HUGE amount of special color themes and other options, each of the following apps can get you creating word tag clouds quickly and easily. Word Clouder – At only .99 cents at the time of this posting, Word Clouder isn’t going to break the wallet. With limited visual options (font and background color, font size, and minimum word number are about it), this app is perfect for getting past the “fluff” of Wordle, and using word tag clouds as an immediate learning tool embedded in your lesson or activity, rather than just a way to make your students’ work look pretty. Copy and paste any text on your iOS device into Word Clouder, and you’re good to go! Word Map Free! – While this app is free, it comes with a huge limitation from the Word Clouder App. 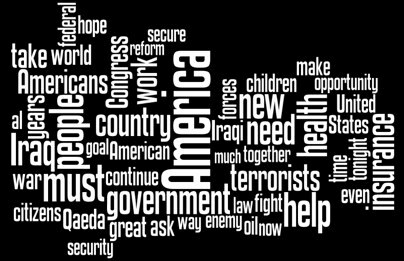 Word clouds created using this app must be created using only internet sources, no copying and pasting of text from documents, e-mails, or other iOS applications. While it does produce some interesting clouds based on search terms, and allows you to rearrange, edit, and delete words, altering the existing word cloud, the content it pulls from must be online first before using it to search for frequency. Either type in a URL, or enter a keyword for searching the internet to create clouds here. I’ve used it when studying poetry – if you paste in the poem it draws out repeated images and key words. A very good example was in “Nothing’s Changed” from the GCSE anthology. Great post! I love the idea of showing data using Wordle. An interesting comparison to try is MLK vs. Malcolm X, to see the differences in their messages. Results aren’t exactly what you’d expect. I love the idea of a comparison between the messages of Malcolm X and MLK Jr. I have found Wordle extremely useful as a pre-teaching strategy to help students find the central messages of primary documents, particularly with students that have difficulty reading them. By determining words that are used more frequently in, say, the Declaration of Independence, students can figure out a general idea of what to expect from the document before they begin reading it. – Copy the responses from the Google form into the Wordle field. This cloud gives the class a picture of what ‘we’ think in relation to magnetism. The word cloud gets kids asking questions about the current state of understanding in the room. – “Do some stuff” that inspires learning around different aspects of magnetism, specifically related to its relationship to moving electric charge. – As a follow-up later in the unit, ask students to respond to the Google form again. Paste these responses into a new Wordle field, and compare it to the first Wordle. By examining the similarities & differences between these two Wordles, the class is now examining what we have learned, and how our thinking has changed. Once I get the blog post written, I’ll hopefully remember to put a link to it here. Thanks for getting the ball rolling! I love it! A nice visual representation of the student’s pre-knowledge and/or conceptions. You could post the resulting image to your class website or wiki to help guide the learning process, and then display the the post-learning wordle side by side the first one. Please do link when you have the post written, I’d love to see your finished thoughts. Trying to get all my links realigned now that Posterous went and closed up shop. Thanks again for the inspiration to finish the post! It started as a year project experiment….but teachers and students use the site regularly…so it will continue. Students and teachers are encouraged to guess the wordle each day by looking at the clues hidden in the wordle….and if you hover over the wordle, you will see the answer. Monday’s are simple. Tuesday is a famous date. Wedensday is a bit more complex (compared to Monday). Thursday is the title of a book, song, story, etc. Friday is a location. It has been great fun….and personally, I am learning a great deal as well as I create them. Daily Wordle Puzzle = a HUGE win in my book 🙂 I picked out the NASCAR one easily enough, and the 500 hats of Bartholomew Cubbins (the name is a huge giveaway), but struggled with this weeks location (glad for the hint). I wonder what the results would be if you took different chapters of a book that a class was reading, or perhaps a few stanzas of some Shakespearean play. Might be interesting to try to see if you could identify the important characters or mood in a scene based on the word cloud. I am glad you enjoyed the page — I honestly am learning a great deal myself as I create the wordles each month. I just learned about Wordle yesterday. Guess I’m a little behind the times. Love it, and love the suggestions for use here. My focus is on teaching parents how to effectively work with their child on school work. The second suggestion you have is a great one for allowing the student to find their own over-used words in an essay, rather than have the parent be the “nag” and point them out. Good stuff. We just discussed Wordle on my blog. I’ve used it in a few ways, however my favorite thus far was to identify the student behaviors teachers felt were most important to address at our school. I used the data from a Google Docs survey to make the Wordle and it really highlighted what was deemed most important by the staff. Want some more ideas for using Wordle? A few years ago, I wrote this: http://thecleversheep.blogspot.com/2008/10/top-20-uses-for-wordle.html The real value is found in the wonderful ideas that follow in the comments. Thanks for the extra resources Rodd. I can see a lot of potential in some of your examples. And like you, I got a LOT of really great examples and value in the comments here too, especially the powerful example of Tony’s pre-assessment piece above. Great uses for wordles. I have seen some crazy wordles used at my school for Art and English projects. They are being used more and more. There’s a site that collects wordles at wordle word cloud. On http://www.txt2pic.com you can make more fake images with your text.